New York is unique among the major subways of the world in the extent of interlining its network has. All routes share tracks with other routes for part of the way, except the 1, 6, 7, and L. The advantage of this system is that it permits more one-seat rides. But the disadvantages are numerous, starting with the fact that delays on one line can propagate to nearly the entire system, and the fragile timetables lead to slower trains and lower capacity. New NYCT chief Andy Byford just released a plan calling for investment in capacity, called Fast Forward, focusing on accessibility and improved signaling, but also mentioning reducing interlining as a possibility to increase throughput. In London, there is extensive interlining on the Underground, but less so than in New York. The subsurface lines form a complex interconnected system, which also shares tracks with one branch of the Piccadilly line, but the Northern, Central, Victoria, Jubilee, and Waterloo and City lines form closed systems (and the Bakerloo line shares tracks with one Overground line). The Northern line reverse-branches: it has two central trunks, one through Bank and one through Charing Cross; one southern segment, with through-trains to both trunks; and two northern branches, each sending half its trains to each trunk. The other closed systems have just one trunk each, and as a result are easier to schedule and have higher capacity. As the Underground moves to install the same high-capacity signaling on more and more lines, we can see what the outer limit of throughput is on each system. The Northern line’s new moving-block signaling permits 26 trains per hour on the Bank trunk and 22 on the Charing Cross trunk. When the Battersea extension opens, reverse branching on the south will end, pairing the older line to Morden with Bank and the new extension with Charing Cross, and capacity will rise to 32 tph per trunk. Planned improvements to transfer capacity at Camden Town, the northern branch point, will enable TfL to permanently pair each northern branch with one central trunk, raising capacity to 36 tph per trunk. Moreover, TfL expects moving block signaling to raise District line capacity from 24 tph to 32, keeping the current reverse branching. The Victoria line already runs 36 tph and the Jubilee line soon will too, while the Central line runs 35 tph. So 36 vs. 32 seems like the difference coming from the final elimination of reverse branching, while more extensive reverse branching reduces capacity further. The reason complex branching reduces capacity is that, as delays propagate, the schedule needs to incorporate a greater margin of error to recover from unexpected incidents. It also slows down the trains, since the trains are frequently held at merge points. The general rule is that anything that increases precision increases capacity (such as automation and moving block signaling) and anything that reduces precision reduces capacity; reverse branching reduces timetable precision, because each train can be delayed by incidents on more than one line, making delays more common. NYCT has its work cut out for it when it comes to deinterlining. 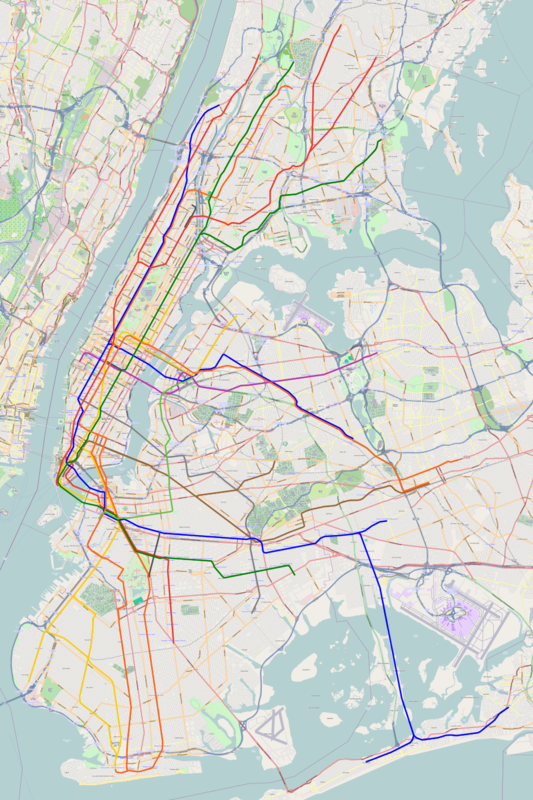 There are eight different points in the system where reverse-branching occurs – that is, where lines that do not share track in Manhattan (or on the G trunk outside Manhattan) share tracks elsewhere. The 2 and 5 trains share tracks on the Nostrand Avenue Line. The 2 and 5 also share tracks in the Bronx. The A and C trains share tracks on the two-track narrows through Lower Manhattan and Downtown Brooklyn. The A and D share the express tracks on Central Park West while the B and C share the local tracks. The E and F share the express tracks on Queens Boulevard, while the M and R share the local tracks, the E and M share the tunnel from Queens to Manhattan, and the N, R, and W share a different tunnel from Queens to Manhattan. The B and Q share tracks in Brooklyn, as do the D and N.
The F and G share tracks in South Brooklyn. The M shares the Williamsburg Bridge tracks with the J/Z but runs in Manhattan on the same tracks as the F.
NYCT should work to eliminate all of the above reverse branches. The easiest to start with is #6: the junction at DeKalb Avenue should be set to keep the B and D trains together and to keep the N and Q together rather than to mix them so that the B shifts to the Q tracks and the D to the N tracks. This requires no changes in physical infrastructure, and has especially high benefits as the junction delays trains by several minutes in each direction. Moreover, the loss of one-seat rides is minimal: the BDFM and NQRW run closely parallel in Manhattan and intersect with a transfer at Herald Square in addition to the inconveniently long BQ/DNR transfer at Atlantic Avenue. Another relatively easy reverse branch to eliminate is #8, a recent introduction from the 2010 service cuts. Previously, today’s M route in Queens and Manhattan was covered by the V train, which turned on the Lower East Side, while the M ran the same route as the J/Z, merging onto the R and thence the N in Brooklyn at rush hour. Today’s route is thus an M-V merger, which railfans including myself hoped would help decongest the L by creating an alternative route from Williamsburg to Midtown. Unfortunately, such decongestion has not happened, perhaps because gentrification in Williamsburg clusters near the L and not near the J or M.
Fixing the reverse-branching at DeKalb Avenue and on the Williamsburg Bridge is painless. The other reverse branches require a combination of hard decisions and new infrastructure. Fixing reverse branches #3 and #4 requires no capital investment, just political will. Reverse branch #4 is there because there’s demand for two routes’ worth of capacity in the tunnel from Brooklyn but there’s only one express line on Eighth Avenue, and that in turn is the result of reverse branch #3; thus these two issues should be tackled together. NYCT should decide between having the A and C trains run express between 145th and 59th Streets and the B and D trains run local, or the other way around. This is not an easy decision: either Washington Heights or Grand Concourse would get consigned to local trains. North of 145th the total number of boardings is 102,000 at B/D stations compared with 79,000 on the A/C, but conversely Concourse riders can change to the express 4 trains whereas Washington Heights’ only alternative is the local 1. However the A and C run, express or local, the E should run the opposite in Manhattan – it can merge to either the local or express tracks – and the express trains should continue to Brooklyn. The map I made doesn’t distinguish local from express service, but my suspicion is that Washington Heights should get express trains, on account of its long commutes and lack of fast alternatives. The same problem of harshness occurs in reverse-branch #5. In theory, it’s an easy fix: there are three track pairs in Queens (Astoria, Queens Boulevard local, Queens Boulevard express) feeding three tunnels to Manhattan (63rd, 60th, and 53rd Streets). In practice, the three Manhattan trunks have astonishingly poor transfers between them in Midtown. Nonetheless, if it does nothing else, NYCT should remove the R from Queens Boulevard and route all 60th Street Tunnel trains to Astoria; together with fixing DeKalb Avenue, this would separate the lettered lines into two closed systems, inherited from the BMT and IND. However, undoing the connection between the BMT and the IND probably requires constructing a transfer station in Long Island City between Queensboro Plaza and Queens Plaza, which involves a few hundred meters of underground walkway. Even then, the connection cannot possibly be convenient. The saving grace is that Eighth Avenue, Sixth Avenue, and Broadway are close enough to one another that passengers can walk to most destinations from any line. Subsequently, NYCT should make a decision about whether to send express Queens Boulevard trains to 63rd Street and Sixth Avenue and local trains to 53rd and Eighth, as depicted in the above map, or the other way around. The problem is that the merge point between 53rd and 63rd Street Tunnels is one station east of Queens Plaza, at a local station, and thus the true transfer point is Roosevelt Avenue, far to the east. Riders on the local stations west of Roosevelt would get no choice where to go (though they get little choice today – both the E and M serve 53rd Street, not 63rd). The argument to do things as I depict them is to give the local stations access to 53rd Street; the argument to switch the lines is that there is more demand on 53rd than 63rd and also more demand on the express tracks than the local tracks, so the busiest lines should be paired. However, this in turn runs into turnback capacity limitations on the E in Manhattan, at the World Trade Center bumper tracks. Potentially, NYCT could try to convert 36th Street into an express station, so that passengers could connect cross-platform. But such a dig would be costly and disruptive to operations. There were plans to do this at 59th Street on the 1/2/3 a few decades ago, for the transfer to the A/B/C/D, but nothing came of them. The remaining reverse branches get increasingly more difficult. Already #7 requires new turnouts. The South Brooklyn trunk line has four tracks, but there’s not enough demand (or space in Manhattan) to fill them, so only the local tracks are used. There are occasional railfan calls for express service using the F, but it’s better to instead use the express tracks to segregate the G from the F. The G could be turned at Bergen Street on the local tracks, while the F could use the express tracks and then transition to the locals on new turnouts to be constructed at Carroll Street. Also in the category of requiring new turnouts is #1: Rogers Avenue Junction is set up in a way that briefly forces the 2, 3, and 5 trains to share a short segment of track, limiting capacity. This can be resolved with new turnouts just east of the junction, pairing Nostrand Avenue Line with the local tracks and the West Side and the portion of the Eastern Parkway Line east of Nostrand with the express tracks and the Lexington Avenue Line. Trains on Eastern Parkway could either all go local, or keep the current mixture of local trains to New Lots (currently the 3) and express trains to Utica (currently the 4), skipping a total of two stations. This fix also reduces passengers’ access to one-seat rides, but at least there is a reasonable cross-platform transfer at Franklin Avenue, unlike on Queens Boulevard or at 145th Street and St. Nicholas. And then there is #2, by far the most difficult fix. Demand on the White Plains Road branch in the Bronx is too strong to be a mere branch: the combined number of boardings at all stations is 166,000 per weekday, and besides, the line branches to Dyre Avenue near its outer end and thus needs the frequency of either a trunk or two branches to ensure adequate service to each other branch. This is why it gets both the 2 and 5 trains. There is unfortunately no infrastructure supporting a switch eliminating this track sharing: the 4 and 5 trains could both use this line, but then the 2 has no way of connecting to Jerome Avenue Line without new tunnels. On the map, I propose the most obtrusive method of fixing this problem: cutting the 3 trains to a shuttle, with a new pocket track at 135th Street, letting passengers transfer to the 2, ideally cross-platform. With all through-trains running on the 2, there is no need (or space) for the 5 on White Plains Road, and instead the 5 should help boost the frequency on Jerome Avenue. In addition, some work is required at Woodlawn, which currently has bumper tracks, fine for a single branch but not for a non-branching trunk line (the bumper tracks on the L limit throughput to 26 tph no matter how good the electronics are). Deinterlining is a service increase. Lines that today only get half or two-thirds service would get full trunk frequency: Second Avenue Subway would get the equivalent of the Q and N trains, the Astoria Line would get the entirety of 60th Street Tunnel’s capacity, Eighth Avenue would get more express trains, and 63rd Street Line and the South Brooklyn Line would get more than just the half-service of the F. With six track pairs on the lettered lines through Midtown and six north and east (Central Park West*2, Second Avenue, Astoria, Queens Boulevard*2), there is no room for natural branching to give more service to busy areas than to less busy ones. One solution to this situation is targeted development on weak lines. Even with half service, South Brooklyn has underfull F trains, and Southern Brooklyn’s B, D, N, and Q trains aren’t much busier, making this entire area an attractive target for upzoning. However, it’s more interesting to look at lines with extensions that suggest themselves. Second Avenue Subway has the obvious extension north to Harlem in phase 2, and a potential subsequent extension under 125th Street to Broadway, which is less obvious but popular among most area railfans (including one of my inside sources at NYCT). The Astoria Line has a natural extension to LaGuardia, ideally elevated over Ditmars to capture local ridership on Astoria as well as airport traffic; while the steel el structures in New York are soundboxes, it is possible to build quieter els using concrete (as on the 7 el over Queens Boulevard in Sunnyside) or a mixture of concrete columns and a steel structure (as on the Metro 2 and 6 els here in Paris). The Nostrand Avenue Line provides an especially interesting example of a subway extension suggested by deinterlining. The terminal, Flatbush Avenue, was intended to be temporary, and as a result has limited turnback capacity. To prevent it from constraining the entire 2 route, which became the city’s most crowded even before Second Avenue Subway began decongesting the 4 and 5, it would be prudent to extend the line to Sheepshead Bay as the city intended when it planned the line in the 1910s. In contrast, a subway extension under Utica, a stronger bus corridor than Nostrand with a strong outer anchor at Kings Plaza, loses value under deinterlining. It could only get a branch and thus have lower capacity than Nostrand. It would also definitely force branching on the express trains, whereas without such an extension they could run as a single unbranched line between Woodlawn and New Lots Avenue via Jerome Avenue, Lexington Avenue, and Eastern Parkway. A Utica subway should wait until there is political will to fund an entirely new crossing into Manhattan, presumably via Williamsburg to help decongest the L.
A second extension I have occasionally mooted, a subway under Northern, loses value even more. Such a subway would be a fourth trunk line in Queens and have to come at the expense of capacity on Queens Boulevard. It is only supportable if there is an entirely new tunnel to Midtown, passing under the mess that is the tracks in Long Island City. Fast Forward proposes moving block signaling on the most crowded subway segments, but typically only on trunks, not branches, and in some cases not even entire trunks. But in the long term, New York should transition to moving blocks and automation on all lines – at the very least the highly automated system used on the L, but ideally fully driverless operation, in recognition that wages are going up with economic growth but driver productivity isn’t. Simultaneously, deinterlined operations should allow tph counts in the mid 30s or even more (Metro 13 here runs 38 tph and Metro 14 runs 42). Instead of the potpourri of lines offered today, there would be fewer, more intense lines. Nomenclature would presumably change to deal with the elimination of some services, clarifying the nature of the subway as a nine-line system in which five lines have four tracks and four lines have two. Each of these fourteen track pairs should be able to support a train every 90-105 seconds at the peak; not all lines have the demand for such frequency, and some have capacity-limiting bumper tracks that aren’t worth fixing (e.g. the 1 at Van Cortlandt Park), but many lines have the infrastructure and the demand for such capacity, including the express lines entering Midtown from Uptown or Queens. Off-peak, too, service would improve. There is ample capacity outside rush hour, but turning the system into one of lines arriving every 4-5 minutes with strategic transfers rather than every 8-10 minutes would encourage people to take the trains more often. The trains would simultaneously be faster and more reliable, since incidents on one line would wreck service on other trains on the same line but leave the rest of the network unaffected. With service improvements both during and outside rush hour, New York could expect to see substantial increases in ridership. Raising peak frequency from the current 24 tph to 36 tph on the busiest lines (today’s 2/3, 4/5, A/D, and E/F) is equivalent to building an entirely new four-track subway trunk line, and can be expected to produce similar benefits for passengers. The passups that have become all too familiar for riders on the 4, L, and other busy trains would become a thing of the past unless ridership rose 50% to match the increase in capacity. > However, undoing the connection between the BMT and the IND probably requires constructing a transfer station in Long Island City between Queensboro Plaza and Queens Plaza, which involves a few hundred meters of underground walkway. The walkway doesn’t need to be underground, it can be elevated. > The problem is that the merge point between 53rd and 63rd Street Tunnels is one station east of Queens Plaza, at a local station, and thus the true transfer point is Roosevelt Avenue, far to the east. 53rd has a cross-platform transfer to/from the 6th Ave trunk at 7th Ave station, so the missing transfer issue is only between 63rd and 8th Ave.
#1 and #7 could potentially be fixed with (perhaps “temporary” or removable) platform extensions rather than new turnouts if that’s cheaper, allowing trains on what are currently the express tracks to stop at Nostrand Av, Kingston Av, Carroll St, Smith-9 Sts, and 4 Av-9 St.
How much demand would shift to frequent fare-integrated regional rail, at the Woodlawn, Williams Bridge, and planned Tremont Ave and Hunts Point Ave stations? (Regional rail might also take some demand off Queens Blvd express.) The right-of-way that could have allowed converting the Dyre Ave line back into a regional rail branch has unfortunately recently been built on. > In contrast, a subway extension under Utica, a stronger bus corridor than Nostrand with a strong outer anchor at Kings Plaza, loses value under deinterlining. It could only get a branch and thus have lower capacity than Nostrand. If a Utica subway is possible, an alternative deinterlining strategy would be to route all express trains to Utica (decreasing demand on Nostrand since it’s partly fed by riders who walk/bus from areas better-served by Utica) and splitting local trains between Nostrand and Livonia/New Lots. This would eliminate the need for any new turnouts or platforms on Eastern Parkway or any expansion of the Nostrand & Flatbush terminal (though of course these are small expenses compared to building the Utica subway). Overall I think deinterlining is agnostic between Nostrand and Utica extensions (though it means you shouldn’t do both, and should perhaps consider splitting the difference via Flatbush). If you undo the BMT-IND connection in Queens, you could also for a better connection, do your idea of sending Flushing to 60th and Astoria to 42nd. This also matches tunnel demand better and gives Chinatown and Flushing a 1-seat ride to each other. I doubt with Alon’s configuration the IND lines will transfer to a job in Midtown (maybe 6th to Midtown East in the 40s will transfer to 53rd St. Tunnel). And Flushing and Astoria will only transfer @ QBP or in Manhattan (if Astoria gets the 42nd St. Tunnel). I’m also not so sure capacity would be an issue as far out as White Plains Rd. — or even Westchester Ave. — if White Plains Rd. got only 15-18 tph. I don’t think White Plains Rd. necessarily needs a full trunk. And regional rail will help with capacity on Westchester Av./White Plains Rd. (though SAS Phases 2 and 2.5 will hurt). The structure at Queensboro Plaza would have to be completely rebuilt for this. And the new 42nd-Astoria line would have no access to a yard, and extremely difficult access to get to one (unlike the current W which just has to keep going down into Brooklyn). Trying to think if you wouldn’t have to change the infrastructure if you did a wrong-way cross-platform transfer for the Astoria and Flushing Lines. Most likely then, both Flushing and Astoria would transfer in Manhattan to the Lexington Ave. Lines for jobs on the eastern side to slightly eastern side of Midtown, but would have an easier time visiting friends, etc. within Queens. Still, storage facilities are a problem. The Flushing tracks feed directly into the 42nd St tracks, both are on the south side of the station, and the Astoria and 60th St tracks are both on the north side of the station. You would have to build complex flyovers west of the station to switch the pairing here. And you would have an orphan 42nd-Astoria line that has no access to a yard and only very complex and disruptive ways for its trains to reach one. The five years it would take to reconfigure Queensboro Plaza makes it a not-viable option. They could build flyovers and duck unders so IRT trains could still go out to Corona. Empty but still go out there. Why would you do a wrong-way cross-platform transfer at QBP? The right-way transfer is far more important. @Alon — Of course reconstructing QBP for a wrong-way cross-platform is stoopid. My point was that if all you have to do is just switch the routes so that Flushing goes to 59th and Astoria goes to 42nd without any additional infrastructure (similar to fixing DeKalb), then putting up with a wrong-way cross-platform transfer may be worth living with in order to match line with tunnel demand. But clearly that’s not the case here. a) An elevated walkway between QP and QBP is easier, yes. But you still need an elevator to get underground. b) There’s waaaaaay more demand to 53rd to 63rd, so the 53rd-to-Sixth transfer isn’t that valuable; the M is a pretty weak line, unlike the overcrowded E.
c) Yes, platform extensions are a potential way to not have to build new turnouts at Rogers Avenue Junction and on the South Brooklyn Line. I would advise against them just because there’s space for turnouts in the cut-and-cover tunnels and you do want the flexibility of being able to run express during service diversions. d) Regional rail isn’t that helpful with the 2 – it’s too far away from most of the line in the Bronx, except Wakefield (maybe also the Gun Hill-to-Wakefield stretch but that’s separated from the Harlem Line by the Bronx River Parkway). It’s more helpful as a fast alternative to the B/D, which would be another argument for running the B/D local on CPW and the A/C express. A higher-investment regional rail plan could take some pressure off the 6, but it’s a different order of magnitude from deinterlining – 30-odd km of tunnel compared with 7 blocks of pocket track plus some turnouts and new transfer corridors. e) Flatbush is pretty weak, and I think might have water table problems that are worse than both Nostrand and Utica’s. You can put Nostrand on a branch and make Utica a trunk, sure, or you can do what the main plans promulgated by railfans both within and outside the MTA do and put Utica on a branch. The problem is that, as I said to Eric downthread, you end up having relatively busy branches – 60,000 boardings on Nostrand today, vs. about 33,000 on each of the western branches of the Central line, 20,000 on Dyre Avenue, 51,000 on the White Plains Road Line north of the split with Dyre, and about 45,000 on each of the eastern branches of the Central line. Fwiw, I do think if you send QB Local to 53rd to 8th and QB Express to 63rd to 6th Local, demand on QB Local and 63rd will increase — the latter dramatically. 53rd to 8th is essentially the median Midtown job north/south, and 63rd to 6th is essentially the median Midtown job East-West. I think few Midtown riders on the QB Lines will change — just the 63rd St. tunnel to get to Midtown jobs in the 40s east of Park or Lexington Ave. Most commuting to Midtown will keep the one-seat ride, and take the longer walk (e.g., 53rd St. tunnel to a job on 42nd St.). The transfer from an IND line to a BMT/IRT Line for a Midtown job would be a dealbreaker for many. Further, with ESA, more LIRR commuters at Jamaica commuting to the east side would take ESA rather than QB Express if QB Local were to get the 53rd St. Tunnel and QB Express were to get 63rd St. Tunnel to 6th Local. And giving QB Local better coverage would induce more people to live on a solely QB local line and/or take the QB Local instead of the QB Express. The Queens Boulevard express should go to 63rd Street to balance out loads. e) I don’t think the MTA/railfan Utica proposals get as far as specifying a service plan? If Utica opened as a branch (with just the 4) there’d immediately be a very strong case for shifting the 5 there as well, especially they hadn’t fixed Rogers Ave. 60k on Nostrand minus riders shifting to Utica sounds like a decent match for 51k on northern White Plains Rd, so it seems tolerable for both to get by with just half of 7th Ave Express (i.e. just the 2). c) There is not space for the turnouts in the cut-and-cover tunnels. The tunnel structure will have to be modified to deal with the removal of weight-bearing columns. My regional rail proposal involves about 30 km of new tunnel. In contrast, the deinterlining I’m proposing in this post involves switching around some trains, without much new physical infrastructure required – just the pocket track, turnouts, and some additional transfer capacity. I thought you were proposing some additions to your aforementioned plan. Platform extensions would eliminate flexibility. They should not be done. Thanks so much for this, Alon. One thing I’d point out is that Second Ave Subway Phases 2 and 2.5 work best when everything is de-interlined. SAS Phases 2 and 2.5 are all about 2-seat rides — Washington Heights Lines, Grand Concourse Line*, and Harlem Line to UES; 4*/5*/6, Hudson, Harlem, and New Haven Lines to Midtown West; UWS to UES; UES & East Harlem to West 4th. De-interlining increases the effectiveness of SAS Phases 2 and 2.5. * My IRT Bronx de-interlining plan is your original one — Jerome Ave to 7th Express and White Plains and Dyre Ave getting Lexington Ave. Express. It shouldn’t be done until after SAS Phases 2 and 2.5 are complete to maintain Grand Concourse’s 2-seat ride to UES. The Jerome Avenue line doesn’t connect to Lenox Ave./Broadway Express. Back in the day Jerome Avenue had service to the West Side on the Ninth Avenue El. Local and express to Ninth Ave. and Sixth Ave. according to Wikipedia. Of course Jerome Ave. doesn’t go to the West Side. My de-interlining plan would 4-track the Grand Concourse @ 149th, and give Jerome the 2, and White Plains/Dyre Ave the 4/5. Would be built until after 125th to 2nd to 7th to Broadway is done (and a full trunk), retaining the Grand Concourse Line’s 2-seat ride to UES (with a subterranean transfer on a trunk at 125th and St. Nick — rather than currently on a Branch on an elevated line at Yankee Stadium). It already is four tracked on the upper level at 149th and Grand Concourse. The tracks and the platforms point north/south. The tracks and the platforms for Lenox Avenue are on the lower level and point east/west. That’s not going to be rearranged easily. For an extra 7-8 trains per hour on UES/UWS (3-4 per Line), it’s probably still worth the cost — both finanacial and space-wise. No, the upper level is only three-tracked. And if you send all of Seventh Ave trains to the lower level and all of the Lexington Ave trains to the upper level you don’t have to build anything. Sounds good but what do you do about the existing 145th/Lenox and 148th/7th stations? For IRT Bronx, I have Harlem and Jerome Ave. going to 7th Express and White Plains Road and Dyre Ave going to Lexington Express. But this shouldn’t be done until at least SAS Phases 2 and 2.5 are complete (do not do SAS Phases 3 and 4) in order to retain the Grand Concourse Line’s 2-seat ride to UES. I think Alon’s IRT Bronx solution of full service on Jerome Ave to Lexington Express, White Plains Rd. to 7th Express, and Harlem on 145/Lenox and 148/7th getting a shuttle has a lot of problems, as Eric and I have pointed out. His original IRT Bronx solution— the one I propose — is, I think, a lot better. But for at least the next 5-10 years, I think you have to bite the bullet, and keep IRT Bronx the way it is. Dyre Avenue could be a branch of Alon’s Line 1. The New Haven Line can’t handle 30 TPH, so some trains could go here or to Port Washington. Line 1 can’t handle 30 tph either because of track sharing with Amtrak. What is the maximum number of regional rail trains that can run over the Hell Gate? My guess is around 12 excluding intercity trains, assuming either Dyre Avenue as a branch (running 6 tph) or four-tracking everything in the Bronx except the bridge itself. The actual 5- and 7-line plans I’m proposing involve 6 tph, with 12 on PW and another 6 given to intercity trains. @newyorksfuturetransit: The ROW between the Dyre Ave line and the NEC (“Line 1”) has recently been built on so making it a regional rail branch would now be pretty challenging, unless you’re willing to eminent-domain several 10-story buildings, or maybe eliminate the Bronx River Parkway and use its ROW. Or I guess tunnel under Morris Park Ave. Also I think Alon is against adding further branches to Line 1 in the Bronx as its capacity is already restricted by having to share tracks with intercity trains and the Port Washington Branch? @newtonmarunner: Yeah I know that’s your proposal, I was wondering what adirondacker12800’s was. Apologies, @threestationsquare. I thought you were talking to me. And the IRT Bronx proposal is Alon’s original one — not mine. Alon’s almost always the one with better ideas. Does this assume SAS phases 3 and 4 don’t get built? Already that would create another reverse branch situation and interfere with what you sketch out here. That’s right, I forgot to mention SAS phases 3-4 as an extension that becomes much weaker in the presence of a deinterlining plan. But Regional Rail from GCT to Fulton via Union Sq. is much more useful than SAS Phases III and IV, which are further away from the median Midtown job than the current alignment, don’t hit other secondary job clusters like Union Sq., and have massive missed connections. Also, regional rail means you’re essentially getting two additional tracks on UES and the Bronx without having to tunnel there. Do you think that deinterlining will provide enough capacity to reduce the need for SAS Phases 3 and 4? First, if anything, SAS Phases III and IV constrain capacity from the reverse branch. They also increase the transfer penalty at 125th St. for 4/5/6 going to Midtown West and Times Sq. and for UES/East Harlem going to West 4th. The reverse branch also for those living between 2/3 and 4/5/6 in East Harlem makes taking the Q to Times Sq. less competitive than taking the 2/3 (which needs relief), which will have more frequent headways than the Q if SAS Phases III and IV are built. None of the downtown lines, save the A and the L, are anywhere near capacity. Now the M14 and M15 buses have good ridership, but their demand is bi- and tri-directional (unlike, say, Utica, where the B46’s demand is more unidirectional), respectively. Further, SAS Phase III and IV misses connections to all the E-W Queens-Manhattan tunnels, L, J, A/C, N/Q/R/W, 2/3, 4/5. The only line it connects to is the 6th Ave. Express. It goes past 14th St and W. 4th while not touching Union Sq., Meatpacking, West 4th, or even 3rd/14th for a transfer to the L. Etc. SAS Phases III and IV are a bad deal for the costs compared to some substitutes. I think hooking Utica into 3rd Ave. via Bed-Stuy and Williamsburg, and running Local from LES to Midtown, Super-Express to 125th, then 135th to NJ is a much more useful N-S relief line than what is currently proposed. You could also — post-50th St. Subway to Bergenline Ave. — 4-track 3rd Ave., and send Northern to the 63rd St. Tunnel to 3rd Ave. to NJ (across 23rd? Union Sq. and W. 4th? Canal?) while sending 6th Local Uptown for more relief. But my proposals all have far fewer missed connections, and increase capacity far more, than the current SAS Phases III and IV proposals do. And there’s still having regional rail — and extending the Harlem Line from GCT to Fulton via Union Sq., which connects to a lot of lines and a lot of job clusters — far more than SAS Phases III and IV. Though many of them involve long walks, last I knew SAS Phase 2 was going to at least look at connecting to the E/M, 7, L, F, and B/D? The MTA hasn’t guaranteed any of those but they’ve said at least they’ll be studied. Skipping L or F transfers would be unforgivable. I think for SAS Phase III and IV to connect to the F, N/W/R, E/M, and 7, assuming you went on 2nd Ave. in Midtown, you would have to add infill stations on each of those Queens-Manhattan trunks. Doing 3rd in Midtown rather than 2nd would involve would still involve deal-breaker-long walks for Midtown transfers, though at least (1) it’d be a trifle closer to the median Midtown job but not as close as the current 7th/Times Sq., and (2) you could hit the L at 14th, but you’d still miss the F on Houston (and now the B/D on Grand, but hit the J on Bowery). I just think Alon’s Regional Rail Line 4 or 5 (GCT to Fulton via Union Sq) is soooo much more cost-effective than SAS Phases III and IV for all the reasons I’ve written. They are long walks, but not much different from the existing transfers at places like 14th & 6/7th or Times Square-Port Authority. And the L connection is only a half-block walk since the station extends eastward from Third Avenue already. Not to mention that 2nd-3rd is a shorter distance than 6th-7th or 7th-8th. I can’t find a better source at the moment but the header background image on the Second Avenue Sagas site shows all the contemplated connections. Personally I think SAS Phases 3 and 4 is an underbaked idea and probably not a great use of resources for a variety of reasons, but lack of connections isn’t one of them. If you believe everything Google Transit maps has to say the Third Ave. Station on the Canarsie line runs from Third Avenue to Second Avenue. there would need to be staircase between the Second Ave. platforms and the Canarsie platforms. And since would need to be ADA compliant some sort of elevator. The west end of the Sixth Ave platforms under Houston is at Second Ave. Semms like a good idea to connect 42nd Street Second Ave. station to Grand Central. I don’t know if it’s a good idea to have people crossing through Grand Central to get to Second Avenue… encourage them to use the street. @newtonmarunner, that is patently false. Of the E-W lines, there’s not much of a point in connecting to 60th because the transfer to Lex is far too convenient to compete with. Of the remaining transfers, 53rd actually ends midblock between Third and Second, 42nd is a full avenue block away, 14th has an exit on Second Avenue, Houston is on Second Avenue, and Grand St is a simple level change. The transfers are actually fine, though I would rather they revisit Hanover and make that integrated into the Whitehall Complex somehow. Fwiw, I do think because the capacity problem on Flushing is before 74th/Roosevelt, a Northern Blvd. Line as a relief Line from the north might be warranted (have the mythical new Queens-Manhattan tunnel go to 50th St. — and it doesn’t have to be Northern going to 50th — to Bergenline Ave.). I don’t know how much more capacity can be added to Flushing. But first de-interline, eliminate peak-direction express service, and get in some regional rail and maybe Triboro. Why would you eliminate peak-direction express service? It helps balance loading and reduces travel times for people farther out. Delays at the local/express merge point eat a lot of the time savings for express riders (and make local riders strictly worse off). And it doesn’t really “balance” loading since counterpeak local frequency has to equal peak local+express frequency. They do save time. More precise scheduling could really help with this. What @threestationsquare wrote. You still have to send back the reverse direction trains purely local, and the merging causes you to lose a few trains per hour in service. That matters a lot on a line like Westchester Ave. where the IRT lines have capacity issues on UES/UWS. Peak direction express trains also don’t save time for those who don’t live on the part whose stop is skipped during Express times (e.g., Soundview on the 6, Morrisania on the Westchester Ave.). In fact, they increase door-to-door travel time from the lower frequency. Finally, peak-direction Express also miss stops with important connections, e.g., Yankee Stadium where the Grand Concourse Line can transfer to the Lexington Ave. Express (or my plan would have them transfer to 7th Ave. Express after SAS/125th is built). So to me, the costs of 3-tracking outweigh the benefits of those further out getting faster service. If the 5 is removed, do you think 149th/Grand Councourse Station is capable of handling masses of people (possibly half the ridership) getting off the 2 in order to have a quick ride on the 4 to East Midtown? There’s also no elevator between the platforms, so you’d cut-off an important connection for customers with limited mobility without more work there. You don’t think Utica is worth building even as a branch corridor? This would not materially effect the Lexington Ave frequency (you quote 35tph for the London Central Line which is overcrowded and has end branching, and 36tph for less crowded lines with no branching). The other branch of the 4/5 (the New Lots Line) has low demand, and even 18tph is more than it needs. Low-ridership outer extensions feeding a crowded trunk is exactly when you want end branches. Plus, you could make provisions to extend the Utica line separately in the future. Eric has a good point. Looking at my notes, I think Utica on the demand side also (1) relieves a more overcapacity bus route than Nostrand, and (2) covers more transit deserts (which include high ridership circumferential bus routes — B6, B15, B35, B82 — taking commuters to the high ridership L). So a cut-and-cover branch on Utica might be worth more than a full-service trunk on Nostrand. It still might be! The problem is that even conventional branching can eat into peak frequency a little (Moscow Metro’s 39 tph lines can’t branch or even short-turn). It’s a necessary evil on the 2, but at least there the branching is in low-ridership territory. Nostrand is busy for a branch (its stations have 60,500 weekday boardings combined) and Utica down to Kings Plaza would presumably be busier. Bear in mind that at $500 million per km, which I think might be a reasonable cost for a Utica extension with cut-and-cover stations and no big push for cost control, Utica pencils out on cost per rider pretty easily, e.g. doubling over current B46 ridership is enough to get just below $40,000/rider. Unlike SAS phases 3 and 4, a Utica subway would not wreck a deinterlined system – as you mention, the Central line manages high frequency with conventional branching, though all the busy stations are on the trunk. It’s just something that I think becomes weaker, but still potentially strong enough, in the presence of deinterlining. Flip side idea: For IRT Bronx, post-125th St./SAS, give Nostrand and White Plains Road Lexington Ave. Express and Eastern Parkway, Harlem, and Jerome Ave. 7th Ave. Express as (1) the West side doesn’t need as much capacity as the East Side so it can deal with branches more easily, (2) less transfer madness at Grand Concourse/149th, and (3) no Harlem shuttle leading to many 3-seat rides. Then Utica is somewhat more tolerable as a branch for the capacity it limits on UWS. Ultimately, post-125th and a 50th St. Subway, send Utica to NJ via Malcolm X, Bushwick, Grand, Metropolitan, Houston, 3rd in Midtown, 3rd or 5th super-express on UES, Ft. Lee, etc. This relieves the L, provides and 1-seat Harlem/Bed-Stuy ride, a more linear, trunk transfer, two-seat ride for Fulton St./Eastern Parkway Lines to Downtown Williamsburg and Midtown East, and gives the West Side Lines uptown (save CPW Express) an early transfer to Midtown East while providing service to Jerz. The plans for Phase 3 include another level of storage tracks from 21-9 Sts. I would use these to connect to Utica, with stops at Tompkins Square Park, Metropolitan/Bedford, Powers/Union, Humboldt/Montrose, Myrtle/Broadway, Gates/Stuyvesant, Fulton/Utica, before continuing on much the same as a Utica IRT. Yet another reason not to build phase 3 – it has storage tracks underground in Manhattan because money grows on trees or something. The storage tracks exist because the MTA right-sized the yards for the current services and tracks over the years. There isn’t much place to store trains overnight on Second Avenue given the lack of yard space or express tracks. Plus it’s doubtful that you want to send all 30TPH to Hanover and Downtown Brooklyn, especially with the capacity crunch on the L.
Seriously? Where do you expect storage facilities to go on a Manhattan-only subway route? Coney Island? I think we can make Utica work without too much trouble by rebuilding the Myrtle Avenue El. Disconnect the M from the JZ by reconstructing the flyover at Myrtle Av station, send it west down Myrtle, underground it around Fort Greene Park, tie it in with the R either just before Jay St or just before Court St, and send it through the Montague St tunnel. Sign it as the W instead of terminating the W at Whitehall, and send trains from Metropolitan Av thru the NQRW Broadway trunk up Second Av (or maybe to Astoria). Then build the Utica Subway and tie it in with the JZ between Kosciuszko and Myrtle. Fixes the messy junction between the M and JZ at Myrtle, tho taking Utica from subsurface to elevated would probably have a similar at-grade junction unless there’s some significant takings. Utica and Myrtle El both get half a trunk of service, which is plenty (and as good as you’re gonna get without a new trunk). Nowhere sees a service cut. New option from Bushwick to Midtown would relieve the L at least a bit. And we fix the 2 northern branch-3 southern branch issue on the NQRW trunk but going 2-4, so service should match better. It got eaten by spam, sorry. I just saw it but am keeping this copy, not the original, if you don’t mind. I want to like the idea of using the Broadway local trains, since Montague Street Tunnel is so underused, but I don’t like the connection to the Myrtle el. The problem is that such a connection works for getting people from Myrtle to Lower Manhattan, which is not where the bulk of employment is; Midtown-bound riders get worse service than they had in 2009, when they could take the M and change to the F. Moreover, the Williamsburg Bridge is also underfull, if less so than Montague, and removing service from it isn’t all else being equal a good thing. Would Williamsburg Bridge be underfull? With existing J to Jamaica plus the new Utica, with no reverse branching and no turnaround issues in Manhattan, there’s no reason not to fill the trunk to capacity. Unless you mean underfull with riders, in which case there’s probably no fix except keeping the Chrystie St connection, which I think we both agree is a bad move. And if we link the Myrtle El at Jay St instead of Court St the connection to the F is maintained. Also connection to the F would continue to exist at Delancey-Essex.. what am I missing? The whole problem with just building Utica as an extension of the 4 is that it might need more than half a trunk worth of service (to justify building it). Your proposal makes this worse, with an even longer underserved-from-day-one Utica subway. I think Alon also has good point in that not giving Utica some sort of one-seat ride to Midtown — even if it’s an edge case like 3rd Ave. — is problematic. [Granted, most Midtown-bound on the Nostrand/Eastern Parkway Lines switch at Atlantic to one of the Brighton Lines because Broadway Express and 6th Express are considerably faster than Lexington Express and 7th Express going uptown from Brooklyn to Midtown.] That Utica would only get half service only exacerbates the problem. Maybe I’m underestimating Utica demand, but with Nostrand built out I’d figure it gets about as much ridership as the White Plains Road branch in the Bronx. A lot, yes, but not too much for a branch, as the option of Nostrand (as a full trunk, going up Lex) will be attractive regardless of where Utica is going and pull away some ridership and act as an overflow to crowding. And there’s nothing from a cost perspective that demands a full trunk, as long as we’re assuming rest-of-world costs; we’re talking cut and cover then el thru Flatbush and Bed-Stuy, not mined tunnels in Manhattan or bores under a river. If we’re assuming present New York costs, we might as well abandon any pretentions to new track. The key benefit I see with my proposal is that it allows us to fully saturate all links across the East River, which I’d argue would be enough benefit in and of itself to at least build the Myrtle Ave El. From there, Utica suggests itself not just as a Manhattan branch but as an attractive connector through the outer parts of Brooklyn; present underutilization of the J opens up the opportunity to connect to Manhattan anyway. None of the proposals (and certainly not Alon’s here) would send Nostrand up Lexington, they send it via Brooklyn IRT local and then 7th Ave Express, while the tracks are set up for a Utica extension to run express through Brooklyn and then up Lexington. Based on bus ridership and proximity to other lines I think Utica is more worth building out than Nostrand (the close stop spacing on the existing Nostrand line would also weaken any extension), and then Utica can have a full trunk and the Nostrand stub will lose enough ridership to get by with half a trunk. How would you connect the Utica subway to the current J/Z el? There isn’t much space around for a two-level transition. Would need to go from Subway to El somewhere on Malcolm X Av before it hits the J on Broadway. Between Atlantic and Fulton or between Fulton and Chauncey would probably be the best bet, but it is a little far south. The junction itself would be at the corner of Broadway and Malcolm X between Myrtle and Kosciusko. There’s plenty of space for an at-grade junction, which is okay, not great, but given that the J has 3 tracks we could probably make something work with the eastbound J track flying over/northbound Utica ducking under. Having three branches on a two-track line (Williamsburg) is not the best idea. Rebuild the Myrtle Ave El and send Metropolitan Ave trains over it and through Montague St Tunnel. Keeps the J at two branches, we fill up Montague, and Williamsburg Bridge gets better utilized. That route would be rather indirect. Passengers from Metropolitan Avenue to Broadway would transfer there instead of going out of their way through Downtown Brooklyn and Lower Manhattan. @newyorksfuturetransit — While I agree with your opinion, I think @theslibbert’s idea is similar to that of SAS/125th’s (a 2-seat ride from the West Side Lines to UES, a 2-seat ride from the East Side Lines to Midtown West, a 2-seat-ride non-Times Sq. ride from UES to UWS, a 2-seat ride from UES/E. Harlem to West 4th, etc.). S/He wants a 2-seat non-Manhattan ride from North Queens to Downtown Brooklyn and FiDi, etc. The problem I have with this idea is that riders are still transferring on a branch (let alone on a low-ridership line), where the transfer penalty is higher — particularly on weekends — from lower frequency. I also dislike the “Y” merging. I’d still rather give Bay Ridge more trains — even if they aren’t full length — for an easier transfer for the West End/Sea Beach Lines to FiDi and Chinatown/Union Sq. or West 4th (if Montague goes to 8th Local) (depending on the permutation). Okay, next question: How does deinterlining work for sending service to Hudson and Union Counties, which I personally think are better served by the subway than PATH and regional rail? Could you have subway trunks take over PATH in order to reduce the number of transfers Hudson and Union County riders have to Midtown jobs in the 40s and 50s? Could you extend a subway trunk to Hoboken and/or Bayonne? My view is any new tunnels under the Hudson have to be full trunks, with conventional branches in NJ ok. That means no AC over the GWB. Same with WTC PATH integration with the 6… difficult engineering challenge plus the reverse branching in Jersey makes it not worth it. Not clear what do with the Midtown PATH. Either way, PATH is so reversed branched that it’s not a very attractive option for expansion into NY without some serious 4 tracking in Jersey. Problem with just extending trunks into Jersey is none of them dead-end in Manhattan except the J, but sending that to Exchange Place duplicates the PATH and Hoboken is out of the way. Bayonne, maybe, but that’s a longgggg tunnel. I did like your idea of Northern Blvd to New Jersey through a new trunk. I’d say through Sunnyside Yard (pending development), somewhere in the mid-50s through Manhattan, and through the tunnel under the Palisades currently used by PATH. 50th St is more lucrative than mid-50s, but is probably better served as a long-term regional rail corridor (thinking back to Alon’s critique of the RPA’s rail plan). I completely agree with you on the one-branch under a river rule. Same with full trunks to NJ. I’m thinking something like adding 2-3 trunks to NJ — one off WTC taking over PATH to Newark, one off West 4th to Hoboken and Newport with a transfer at Grove St., and possibly sending the Broadway Local Line to Bayonne and the Montague Tunnel to 5th Ave. via West 4th (IND Lines) 14th & 6th (L), 23rd & 5th (Astoria or Flushing), 34th & 5th, 42nd & 5th (Astoria or Flushing), 50th & 5th (new Queens-Midtown-NJ trunk), 60th & 5th (Flushing or Astoria), to UES or Amsterdam — whichever needs more relief. The first two lines would eliminate PATH’s reverse branching; the latter would add coverage to Bayonne, and give Bay Ridge a better connection to the median Midtown job while also giving easier two-seat rides to secondary destinations like West 4th. Hmm.. my inkling is we should prioritize one or two more cross-Manhattan trunks after Northern Av-Union City before we think about a new N-S subway. Regional rail (at least Penn-GC-Fulton, and plus that takes care of a major portion of of the latent demand for more N-S Manhattan subway service), a second Queens-Manhattan-Jersey line, maybe L to Hoboken, maybe Bronx-GWB-Palisades. And I don’t see Bayonne as having enough demand to justify a N-S Manhattan trunk. Definitely do a 50th St. subway (might even want to 4-track it) relieving Flushing and QB from the North connecting to IRT Local Lines (giving UWS/W. Harlem a better connection to Midtown East) and hitting 5th and 50th, and then going to Bergenline Ave. before doing a 3rd or 5th Ave. Line. Might even need to do a Queens-Midtown relief line from the South, too, before doing a 3rd or 5th Ave. Line. One of the many reasons for sending the Queens-Midtown trunk lines to NJ is to eliminate the akward Queens-Manhattan-Brooklyn turns. That said, in order to retain certain connections, the R must go to at least as far south as City Hall and the QB lines must go at least as far south as West 4th. If the R is to go to the Hudson, it would have to go to Bayonne, and couldn’t connect to any other subway line in NJ. Yeah, was just realizing I totally forgot the L (and the 7), but like you said, not the most attractive options to be the first subway crossing to Jersey. I think sending either to Hoboken in the long term is worth considering, bc Hoboken NJT-PATH doesn’t serve the Hoboken proper that well, but again Union City and Palisades are probably the first and second tunnels we’d want to Jersey. The L touching any NJ-Midtown trunk before going under the Hudson would reduce demand on the L. The L isn’t a good line to use for NJ. Because it originates north of Midtown (Flushing or Astoria), the 7’s natural habitat is south of Midtown. Something like QB or LIE, which begins south of Midtown, has a Bergenline Ave., which is north of Midtown, natural habitat. **tunnel under Palisades current used by HBLR. And when I was referring to trunks terminating in Manhattan, only the J (and the 6, but eh) terminates in lower Manhattan, but of course we have the 7 and L further up. Deinterlining PATH is a nightmare. The only way to do it that’s even semi-feasible involves cutting off Hoboken entirely; it might be worth it if there’s regional rail diverting trains from Hoboken to Pavonia, but even then, closing the surface Hoboken station opens up land for redevelopment that might be useful to connect to New York. Why can’t you do West 4th to Hoboken to Newport and continue south? That requires a new under-Hudson tunnel. D’oh! I knew I was missing something here. What about … (1) punching through WTC, (2) giving 8th Local (if QB Local gets 53rd St. Tunnel) or Express (if QB Express gets 53rd St. Tunnel) the Montague Tunnel, and (3) sending the Broadway Local to NWK through the WTC PATH route while (4) sending a QB Line — local or express — from West 4th to Newport to Grove St. to McGinley Sq. to West Side Ave.? Or is that too much mixing a radial and a circumferential and/or too little demand. Hoboken could get the 42nd St. Subway. Sorry about the what about … initial post. My PATH/HBLR deinterlining crayon would leave the Hoboken Terminal redevelopment site still less than 500m from a station. @newtonmarunner: PATH is (approximately) IRT loading gauge, trains from Broadway and QB wouldn’t fit. @threestationsquare — Appreciate the info. Guess that means 6 could possibly go to PATH @ WTC, though I’d prefer the Lexington Ave Local to continue on the east side of Lower Manhattan to South Ferry and connecting to as many West Side Lines as possible. I expect a mythical 50th St. Subway to connect to the 1 and 6, and would want someone taking this mythical 50th St. Subway to have a 2-seat ride to the east side of Lower Manhattan. I also still have a dream of getting rid of those akward Queens-Manhattan-Brooklyn turns, and sending all Queens-Manhattan tunnels to NJ. But we’re to put it mildly far away from needing that kind of capacity and/or finding those operating efficiencies. 2) Related to point 1, the Washington Heights trains would then also become the CPW local. This both better matches demand on the branches, but also helps reduce demand on the 4 (which is still very busy.) The cross-platform connection at 125th should not be a large penalty for Washington Heights customers. 3) The concept of a ‘1/2 mainline’ frequency doesn’t really mean much. The F and E run significantly more service than the Q which runs more service than the N and Q. They all run different service. It seem useful to again link my take on NYC Subway deinterlining, which comes to most of the same conclusions you do, although with more of a focus on what can be provided with today’s rolling stock. I have wanted to do this. The big problem I see is by sending 8th Ave to Bay Ridge in Brooklyn is that you then have (1) Fourth Ave. Local going to 8th and Sea Beach and West End going to 7th in Midtown, which is a trifle further from the median Midtown job than today, or (2) have Fourth Ave. Local going to 8th and West End/Sea Beach going to 6th Express, which isn’t ideal for the Chinatown-Sunset Park connection at Canal St. So the R going to Montague has at least some value with the Chinatown-Sunset Park connection. Come to think of it, if the Montague Tunnel gets 8th Ave to the 53rd St. Tunnel, that’s a 1-seat ride for most Midtown jobs. Even if Montague goes to 8th Local to CPW Local, with 8th Express going to 53rd, it’s still from Fourth Ave. Local at worst a cross-platform transfer coming at 30 tph to most Midtown jobs. The E is very heavily used, and making it longer will introduce more delays. Making it not share track with other lines will reduce delays. The reason New York has problems with delays on longer lines is that they share track with more lines, so delays propagate more easily. Otherwise there’s no inherent relationship between length and delays. Connecting WTC to Montague is possible, but there are better solutions. In effect, you gain a little in turn back capacity and average train speed by cutting off the Broadway line from Lower Manhattan, introducing more service through Montague than it needs, and creating a capital project. Question: If you connect 8th Ave. Local to Montague by punching through WTC, and terminate Astoria/Broadway Local at City Hall, where does the Astoria/Broadway Local Line go for storage facilities? Coney Island, same place it would go if it went from Astoria to Bay Ridge. It involves out-of-service yard moves, which is annoying (this is why the R runs on QB and the N doesn’t – this way the R gets to use the IND yard and the N gets to use Coney Island), but trains should spend more time circulating and less time parked at the yard. Thanks. Would continuing to send Astoria-Broadway Local-City Hall trains needing work through the Montague Tunnel to their current Coney Island storage facilities disrupt/degrade service on the new Bay Ridge to 8th Local Line (where Astoria wouldn’t have service)? I’m with you that trains should be running frequently all day — even if it means running some non-full length trains. They go to the yard overnight when it doesn’t make a whole lot of sense to be running empty trains. And a few of them on Saturdays when there are a lot less passengers and even more of them on Sundays. And those pesky pesky subway employees bring their stomachs, bowels and bladders with them to work. And want to use them. And then go home after 8 hours or so. Pesky. And while imagine a train could be cleaned while it’s in motion it probably more efficient to do it someplace where the train is stationary. they do clean them…. I would move the platforms to the north, move the diamond crossover, and use the existing terminal tracks as layup tracks. I would wall off the existing platforms from the tracks, and use the existing platforms as a pedestrian passageway. There already is a pedestrian passageway to the west of the western track. Ah! Branching! Over in Los Angeles, metro is proposing a possible next interlining. Basically the ESFV corridor is likely to be a new at grade 15km LRT and it will terminate where the Sepulveda Pass corridor begins, which is a proposal to send a rail line 30km south from this terminus all the way to LAX. Metro has proposed two interesting branching / interlining Options, one is continue the ESFV LRT all the way south to lax, but to have it branch one stop before the terminus to the west to join the orange line BRT there. This is obviously because they could then proceed with the conversion of the orange line BRT to LRT along this branch. Additionally, this branch provides enough capacity for the corridor to make the tunnels worthwhile. Since the ESFV LRT is at grade and stops are spaced very close together it is limited to three car platforms and about six minute headways. Branching through the tunnel with the orange line LRT would increase the tunnel usage to three minute headways. Metro also proposed an alon levy inspired option, (make every line connect to the CBD), which instead branches the purple line HRT both north to the ESFV terminus and south to LAX and creates two service branches on the purple line trunk (also shared with the red line in the CBD), However, this is a problem route meant to fail because the geography is such that branching the purple line north from its phase three terminus means missing a stop at the north side of the UCLA campus. And UCLA is by far the largest ridership generator in the west la region. So I thought, why not maintain the CBD qualities of the purple line southern extension to LAX with the LRT branched service to the ESFV and orange line LRT? Such a purple line route would Connect HRT to every single LRT line in Los Angeles would go a long ways towards also becoming a partial circumferential route. I even made my very first crayon map of what it would look like, super simple no station names or line names. Needless to say, both the Sepulveda Pass tunnel and the purple line to lax extension would be good candidates for single bore. The Sepulveda Pass because it will funnel under the billionaires of bel aire. Dual bore construction in Los Angeles requires a couple months of jet grouting at every emergency cross passage (every couple hundred meters) which means heavy college nstruction in bel air and in undeveloped canyon country to get the tons and tons of equipment in place to do jet grouting. The environmentalists lawsuits protecting the canyons for construction access and lawsuits from bilionaires with unlimited funds to spend fighting the disruption jet grouting entails means the tunnel will almost certainly never be built. Unless they do single bore, which contains the emergency passageways within the tunnel and doesn’t require jet grouting except at the station platforms. Then there is no disruption to the billionaires or environmentalists. It’s not something you’ve talked about, but the political benefits of single bore in reducing disruption may be worth the additional inconvenience of deeper stations. The saving grace is that Eighth Avenue, Sixth Avenue, and Broadway are close enough to one another that passengers can walk to most destinations from any line. I’m confused. The B division passengers are world class hikers and A division passengers can’t walk from 7th to 8th or back again or from 7th to 6th and back again? And they have the local if the do want to do that. It’s been there since 1904. I’m just recounting real plans that existed at one point to convert 72nd Street to a local stop and 59th to an express stop. Don’t shoot me, I’m just the messenger. I use these plans to point out that adding express platforms to a single-level local station (i.e. not the multilevel 59th Street on the 4/5/6) was judged feasible in one case a few decades ago. C’mon. As I pointed out above, 53rd to 8th hits the median midtown job on a N/S basis; it’s not thaaat far a walk for a job between 59th and 42nd St. that a transfer is worthwhile Similarly, 63rd to 6th hits the median midtown job on an E/W basis; it’s not thaaat far a walk for a job between 8th Ave. and Park. Ave. that a transfer is worthwhile. 59th to 7th is a trifle more difficult, but really most Midtown jobs will be at worst an extra 1-3 blocks walk in exchange for (1) greater reliability, (2) not having to tunnel to add capacity, (3) a much easier evening commute, (4) flexibility to other secondary job clusters that never have been a 1-seat ride, (5) flexibility to take a night job, and (6) greater ability to do errands, go to church, etc., which are done off-peak and usually require transfers. So that still seems like a good deal even if people have to walk an extra block or two or three or have to transfer to a secondary destination or two that currently is a one-seat ride. I wanted to mention a few things about #’s 3 & 4, the AC and BD lines. 1. Since there are cross-platform transfers at 59th St. and 145th St., deinterlining the AC/BD shouldn’t be that inconvenient for riders, and worth the operational improvements. 2. If you run the AC as the uptown express, trains will enter 145th St. from the center tracks and the northbound C train won’t switch to the local track until after the station. I only mention this because maybe it would be easier to extend your proposed 3 train shuttle west from the current Lennox Terminal to this unused platform on the east side of the station? 3. I think of the AC as more of it’s own trunk line, and think one fairly simple project could make this all work much better. Excavate the Court Street Brooklyn Station (current transit museum) and bore a small diameter tunnel to the leaky South Ferry Station and back. 1 train runs local down Fulton Street to Euclid Ave., except some can use the South Ferry Loop Station instead of going to Brooklyn. 1 trains are smaller so you would need to do some station work, but making a platform bigger is much easier than the other way around. AC is a single trunk starting at 145th St. in Manhattan, thru downtown Brooklyn and down Fulton Street to Rockaway Blvd. C goes to Lefferts, A goes to the Rockaways. Combine this with relocating the R train in Queens as you proposed and the E train also operates as a single trunk line. You can’t build an East River Tunnel south of South Ferry. This is why the stupid Red Hook 9 proposal branches after Rector. How would yo deal with ther track layout past Euclid? You are killing flexibility. Making the platform bigger or smaller is trivial; the Astoria Line platforms were shaved back to let the N/W trains run (previously trains ran through to the 7). The hard part is the clearances in the tunnels, which are too tight on the First Subway. But as you say, it’s easier to run smaller trains than bigger trains. It’s actually a really cool idea, though a new underwater tunnel is not going to be cheap. There’s some talk of extending the 1 to Red Hook instead, and if there’s money for an underwater tunnel for the 1, I’d like to see some analysis of whether the new Red Hook connection would be better than increasing capacity on the Fulton Street Line. I was wondering if it was feasible to plug the 1 into Fulton St. Local (assuming G is sent to Atlantic) in order to reduce the number of A train branches. Definitely more useful than 1 to Red Hook. Teaching the passengers to leap across the gap would be interesting. You don’t need to touch the G – it doesn’t share track with the C. Hoyt-Schermerhorn is a six-track station. Ooh, even better. Having Brooklyn/Queens riders transfer to the A on a trunk in Brooklyn/Queens is really useful. Also, with only two branches, much easier to run even headways with either Washington Heights or QB Express — (both which have two branches each, though Washington Hts. could eliminate its few Express stops north of 145th and have one) — whichever gets 8th Ave. Express. How would you isolate the IRT and IND tracks on the Fulton Street Line then? The Fulton St. local would become an IRT track while the Fulton St. Express remained an IND track. It would have significant downsides in the loss of flexibility to send trains between the tracks for construction work or disruptions — essentially it would go from being a 4-track line to 2 parallel 2-track lines — but in normal operations it would be very straightforward. In yards and other areas outside the stations, the 1 trains could already go anywhere the A train can go without any modifications required. How would trains going between the local tracks switch between each other? I guess the layout at Nostrand could be taken advantage of, but the layup/relay area at Euclid is a mjor issue. Or Second Avenue trains could run on the local tracks. Through Court Street where the transit museum now is. I don’t understand what you’re talking about with the layup/relay area at Euclid. C trains turn there now just fine, and IRT trains can run through any tunnels that IND trains can run through. Outside of station platforms it would require no alterations whatsoever to run an IRT train on any IND track (which is why all MTA work trains are IRT-sized and run throughout the entire system regularly). The trains would need retractable extenders or the platforms would need to be slightly widened, to avoid a Mind the Gap situation. I think there are already enough (or too many) connections between Brooklyn and Lower Manhattan, relative to ridership. Another connection, however elegant on the map, would be a waste in terms of ridership. A lot of this could be very valuable, if politically challenging — though worth noting that the easiest changes may actually be more politically difficult than some of the harder changes; disentangling the IRT in the Bronx and Brooklyn would bring complaints but would give some easy connecting points to get to the other trunk line, especially in Brooklyn. Whereas while I agree with the DeKalb plan, it does admittedly create significant penalties in terms of transfer annoyance for some trips. And the M-V de-merger is fairly easy in a world where all of these changes are made and there is “full” service on the F at Delancey, but without that, you run into the issue that there is a one-station gap between the M at Essex and the V at 2 Av, and the half-service F lacks the spare capacity to help people bridge that gap. Then the other problem with all of these proposals is that you have way too much service on a lot of outlying branches. Ideally if you were going to do this, another construction priority would be more mid-line turnback spots to thin out service on the far reaches, as is common in certain places in London today for example (and as happens in a handful of places in New York, like the F train turning back at Kings Highway). Though a few such turnbacks would naturally present themselves thanks to the elimination of other services — for example, the F could also use Church Avenue to turn back some trains since the G would no longer be using it. One other comment: not knowing the passenger numbers in the area, it seems like closing the 3 branch entirely, rather than running a shuttle there that requires very expensive construction to support (especially since the construction of a shuttle track at 135th would also have to remove the flat junction north of the station, one way or another), would be worth considering, though it would surely be a political firestorm. Oh, and one more observation: a bit more attention to what this would do to transfer passenger volumes at key stations is probably warranted. Many NYC stations already have plenty of space, but there is a definite risk of excessive crowding in at least a few places, most notably 149th-Grand Concourse where unlike Brooklyn BDNQ passengers and Queens R passengers, they truly are being switched to a line that is not easily walkable in Midtown from their old line assignment. (2) transferring to the S or 7 at Grand Central to get to Times Sq. To get to Penn, the 4/5 can transfer to the R/W at 59th/Lex, and walk from Herald Sq. Getting to Columbia, UWS, or West 4th from the 4/5, will be … more challenging. Similarly, a 4/5 assigned with the 2 can transfer at 149th/Grand Concourse or Times Sq. (7/S/N/Q/R/W) to get to the East Side of Midtown. A cross-platform transfer to the 1 at 72nd St./Broadway to get to 50th and Broadway will be walkable to at least any Midtown job west of Madison Ave. (exclusive). So while definitely not as easy as all the other de-interlinings, there still are plenty of places in the grid to get to virtually the exact same place. But yes, we should watch key stations such as 149th/Grand Concourse, Times Sq., 59th & Lex, etc. Yeah, closing the 3 is definitely an option. Ridership at the two stops is 7,600 per weekday combined. Whether to close the stations or build the pocket track is entirely a question of how much the pocket track costs. Figure 15,000 riders (7,600*2) lost if the 3 closes, and $40,000/rider as the upper limit of acceptable subway construction costs; then the pocket track should be built if it costs $600 million or less. It’s seven blocks of cut and cover, so even in Manhattan I don’t think it should cost so much, but then again until the SAS phase 2 estimates came out I was sure it’d be cheaper than phase 1, so what do I know. In theory it shouldn’t be that expensive, but it’s also pretty complicated to do the construction right. Ideally you’d want a Whitehall St.-like layout, which requires completely rebuilding the existing 135th St station. So that, plus building a third track for those 7 blocks, plus having one of those tracks dive under the southbound 2 track — which may in turn require rebuilding 145th St station since the connecting track may now be at too low of a level to get back up to the level of the current station north of the 2 crossing — it’s messy. If there weren’t such high demand for the White Plains Rd line in the Bronx, and if the 3 branch weren’t connected to the mainline by a flat junction, you could use it as a conventional branch. Perhaps investigating sending the 2 to Woodlawn could be worthwhile, as then the 3 could be retained as a branch off that line, but that would be extremely difficult to do while maintaining the 7 Av-Lex connection at 149th St, which is a critical feature of the whole plan. Note that the 145th St/Lenox station isn’t even a full length station: only five cars can platform at the station, which is yet another argument for truncating the 3 to a shuttle. The headache I have with truncating the 3 to a shuttle is 3-seat rides to UES/Midtown East/Union Sq. will mean more will walk over to 145th/St. Nick and 155th and take the CPW Express (which has capacity issues in its own right) from there. Also, the shuttle means a 2-seat ride to Times Sq., FiDi, and Downtown Brooklyn. I can take the Dyre Ave. Line, Throggs Neck, Northeast Queens, Cambria Heights, etc. (even Soundview and Hunts Point) — given their proximity to Midtown — having a 3-seat ride to Times Sq. and other major job clusters in Manhattan. I’m not so keen on anywhere in Harlem having 2 and 3 seat rides to virtually everything. How about closing the branch, and putting SBS on the north-south and east-west bus lines there. With deinterlining, many upgrades have to be made to accommodate transfer flow (station capacity) and increased thoughput (terminal capacity). I will go through the 8 different points, one by one. 1. The 2 and 5 trains share tracks on the Nostrand Avenue Line. Transfer capacity has to be increased at Franklin Avenue. The columns should be narrowed to reduce dwell times. http://subwaynut.com/ct/franklinn2/franklinn213.jpg Work should also be done at Nevins Street to spread the transfer load. As you mentioned, the Nostrand Avenue Line needs a new terminal. An extension to Kings Highway should work in the interim. I think that Utica Avenue would get higher ridership than New Lots. In addition, can New Lots handle about 30 TPH. I was under the impression that the terminal at Utica would have to be used. If that is the case, you might as well extend the line down Utica. 2. The 2 and 5 also share tracks in the Bronx. 149th Street–Grand Concourse is the main issue here. The platforms are very narrow and there is not enough capacity for passengers traveling to/from the Lexington Avenue Line. https://www.nycsubway.org/perl/show?120315 The https://www.nycsubway.org/perl/show?128049 columns have to be narrowed and elevators need to be installed. I agree that the 3 has to be turned into a shuttle. We would not be in this mess if the IRT stuck to their original plan with a stop at 141st Street and no branches here. It would cost a lot, but perhaps a new tunnel under the Harlem with a stop at 145th Street could be examined. Some modifications should be made of the East 180th Street stop to eliminate some at-grade conflicts. I would utilize the express track on Jerome Avenue during rush hours. I would convert Bedford Park Boulevard into an express station, and would eliminate the at-grade yard lead conflicts like what was done in 1949 on the Pelham Line when express service was inaugurated. http://tramway-null.blogspot.com/2014/10/pelham-subway-line-track-plan-as-of-1988.html I would add layup tracks north of 161st Street so that it could be used as a short-term terminal. 3. The A and C trains share tracks on the two-track narrows through Lower Manhattan and Downtown Brooklyn. This would eliminate the major bottleneck at Canal Street. What do you think should be done with the upper level of 50th Street which would not be needed anymore? With increased service, more trains should run direct to Rockaway Park. At a Citywide Transit Plan meeting in 2017, someone from the Rockaways mentioned how people along the shuttle would often drive to Broad Channel for the A or to Sheepshead Bay on the B to not have to deal with its unreliability. 4. The A and D share the express tracks on Central Park West while the B and C share the local tracks. 5. The E and F share the express tracks on Queens Boulevard, while the M and R share the local tracks, the E and M share the tunnel from Queens to Manhattan, and the N, R, and W share a different tunnel from Queens to Manhattan. A transfer between Queens Plaza and Queensboro Plaza is an absolute must. Another transfer that should be completed is between the Seventh Avenue (E) stop and the 57th Street (N, Q, R, W) stop. This would provide an additional transfer between the Queens Boulevard Line and the Broadway Line, and would connect to both Broadway expresses and locals. Even though it would be expensive, I think that 36th Street should be converted to an express station. Roosevelt Avenue will become way too congested otherwise. Ditmars and 95th Street need to be reconfigured for increased TPH. There are rumors that there might be bellmouths for a yard south of 95th Street. A small layup yard should be built here. The Astoria Line should be extended to LaGuardia with a yard. World Trade Center capacity needs to be increased. The transfer between Queens Boulevard and the Lexington Avenue express is eliminated by moving the R back to Astoria. A transfer passageway should be built between Lex/59 and Lex/63. 6. The B and Q share tracks in Brooklyn, as do the D and N.
Transfers should be made easier at 34th Street and Atlantic. 7. The F and G share tracks in South Brooklyn. You don’t think that express service would work if F trains ran at 30 TPH? You could have locals end at Church and expresses continue to Coney Island. 8. The M shares the Williamsburg Bridge tracks with the J/Z but runs in Manhattan on the same tracks as the F.
The M has become very popular. This has to be done to reduce interlining, but efforts should be made to make the transfer between Sixth Avenue and Nassau/Jamaica as easy as possible. The Essex Street (J, M, Z) stop needs to be rebuilt with wider platforms and the transfer to the F at Delancey needs to be reworked. To spread out the transfer load, a transfer should be built between Bowery and Grand Street (B, D). The junction at Myrtle needs to be fixed. Yard capacity would need to be increased. A yard expansion for Jamaica Yard has been on the books since the 1980s and there have been multiple proposals to expand 36th Street Yard for passenger service. The Flushing Line (7) barely has enough space to store the R188s. The MTA was cheap and didn’t expand Corona Yard like it initially planned to and has to store trains south of Hudson Yards. I really like your plan, but the one major factor that could kill the improved throughput is station capacity. If people can’t easily and quickly transfer between lines, stations will become overcrowded, dwell times will increase, and the plan will fail. Getting back to station capacity, I think that there is one thing that can be used at high ridership stations: station houses. Mezzanines are often congested with confusing passageways, barriers for fare control, token booths, and MVMs. Station houses, like at Roosevelt/74 or on the London Underground should be built above ground. This would require condemning property, but could be done with additional floors on top of the station. This would really help at Main Street. The building should be built at one of the four corners of Main and Roosevelt. This would provide increased means of egress, and is much better than narrow subway entrances that block the sidewalk. The mezzanine could be decluttered. There are several other places where this could be done. I want to hear what others think about the idea. This seems a good place to start a minority opinion for those who do not necessarily worship at the altar of deinterlining. In the real world, delays propagate throughout the interlined system. This maybe could be mitigated somewhat with more flexible train orders (if train to be merged in is more than a little late, it loses its slot and sobeit that there are two or three X trains in a row and then 2 or 3 Y trains. More complicated changes could also be made on the fly as well, to deal with more complicated complications. Stuff like this gets done anyway, just not as option 1a, more like option 13. Better switches, better signaling, better communications, all can help keep an interlined system reasonably together. My real point has more to do with the cost of uninterlining. This thread is all about keeping the trains moving efficiently and with optimum dispatch. What about the riders? I thought that we built the subway for the people, not for the trains. We know that up to half the riders on an uninterlined route will now have to choose between taking a hike and making a transfer or two. The hikes should not be underestimated; the avenues are pretty far apart and the climate is only really nice a couple of months a year, and there is always rain or snow or sleet of mugging. The wait for the transfer is more or less cancelled out by the possible wait for the right train at the beginning, but the extra congestion and probable loss of a seat and extra shuffling around at the transfer station all diminish the quality of the ride to a pretty substantial degree (not to mention the business about possibly dangerous overcrowding). The designers went to a lot of trouble to set up these clever splits and merges and for the most part built the appropriate grade separations into the system; in some places, trains can even wait for their merge window without blocking following trains. The subway is supposed to be a convenience, not water torture; we want the closest thing possible to door to door service and if it takes a little more work to run the trains right, then hop to it – we built it, we’re paying for it, we want it all. Pesky pesky passengers. On a passenger railroad! If all those pesky pesky passengers disappeared think of how that would cut down on dwell time! And delays! And there wouldn’t be any of them to whine about having to schlepp on a local or having to change trains! And the stations wouldn’t get dirty! No need for HVAC on the cars either! … Certain transit foamers would get into an especially effervescent froth. Yes, what about the riders? At what I think should be the top priority for deinterlining, DeKalb Avenue, the trains lose about 2 minutes in each direction just waiting at the interlocking. As for getting a seat: deinterlining doesn’t reduce the number of seats. On the contrary, it increases it, by allowing trains to run more frequently at the peak (remember the 26 -> 36 tph changes projected for the Northern line). Different passengers might end up in those seats, but the passengers who’d be occupying those seats who don’t today benefit, just as the passengers who’d lose their seats would lose out. Moreover, the transfer itself is a shuffle (though in many cases it’s cross-platform, including Franklin Avenue, Columbus Circle, or a rebuilt 36th Street), but the shuffle is in all cases underground except QP-QBP, whereas waiting longer for the right train in the Bronx and on the Brighton Line means standing out in the open in the weather. Then wait three minutes on a grossly overcrowded platform to change trains. Pesky passengers. None of these platforms would get as crowded as 96th Street. 96th was probably a lot less crowded when the local went to Harlem or 137th and the expresses went to Wakefield or Van Cortlandt Park. But MOAR TRAINS so the platforms are crowded. Alon, you should make a small fix to the map. A portion of the West End Line near Coney Island still is orange. It’s meant to be the Coney Island approach from the south, on the F and Q. No. Look to the left of Coney Island. I don’t see it. Coney Island is where my yellow and orange lines meet; there’s nothing directly to its west – the F joins in a bit east, with an F/Q transfer at the Aquarium.